Located in Parrish, Florida, the Florida Railroad Museum preserves the state’s railroad industry history, offering historic railroad excursions for visitors in the museum’s rolling stock locomotives and equipment. 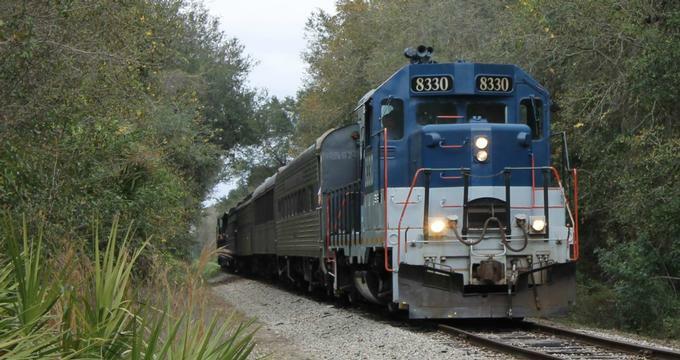 The history of the railroad industry in Florida dates back to the 1860s, with the construction of a line connecting the Fernandina Beach and Cedar Key areas. Additional lines were constructed soon thereafter by the Atlantic Coast Line and Seaboard Air Line railroad companies, which connected the cities of Jacksonville and Chattahoochee and linked with the nearby Louisville and Nashville Railroad. Throughout the 1890s, the lines were expanded into the Tampa area via the Jacksonville, Tampa, and Key West Railroad, which was operated by owner Henry Plant. Prior to Plant’s 1900 death, he constructed a number of hotels and attractions along the railroad which served as the basis for modern-day tourist sites. After Plant’s death, the JT&KW Railroad was folded into the Atlantic Coast Line, which eventually merged with the Seaboard Air Line in 1967 to become the Seaboard Coast Line. In 1971, the Seaboard Coast Line became part of the Amtrak train system. In 1981, the Florida Gulf Coast Railroad Museum nonprofit organization was founded for the purposes of preserving the state’s railroad history, with a specific focus on the height of the state’s railroading operations in the early and mid 20th century. As one of three official state railroad museums since 1984, the museum began acquiring and restoring a large collection of historic rolling stock and equipment, including locomotives, passenger cars, and artifacts related to train stations. Since 1992, the museum has been operating historic visitor excursions embarking from the city of Parrish. Today, the Florida Railroad Museum serves as one of three Official State Railroad Museums, offering weekend excursions for passengers aboard its rolling stock of historic locomotives and train cars. As of 2018, facilities and operations are also being expanded into nearby Willow, which serves as the site for the museum’s restoration and repair work. A planned museum facility in Willow will include public exhibits and displays on the history of the railroading industry in the Florida region, as well as a public look into the museum’s restoration facilities. Diesel trains are operated along a nine-mile section of historic track between Parrish and Willow, recreating the experience of traveling Florida’s railroads in the mid-2oth century. All trains operate rain or shine for weekend excursions, with roundtrips spanning 13 miles and lasting approximately 90 minutes. Cars are furnished with vintage artifacts related to the industrial and cultural history of the Florida region, immersing visitors in the historic experience of railroad excursions. Trains board from the museum’s main facility in Parrish, which offers ticketing services and a gift shop stocked with a variety of railroad-themed apparel, souvenirs, and memorabilia. A miniature railway exhibit is also showcased, along with a historic Pullman Coach and a number of vintage wagons. A concessions stand is offered aboard one of the museum’s train cars, serving light fare and beverages. Historic cars and equipment used by the museum for excursions include the Ex-US Army #1835 road engine, which was donated to the museum in 1993 by the Department of Defense after its service at the Sunny Point Military Ocean Terminal. The engine, constructed in 1951 for military use, now serves as the train’s primary locomotive. Other locomotives in use include the BEDT 12, PORTER 0-6-0T, a switching steam locomotive constructed in 1919 for the Brooklyn Navy Yard that formerly operated as part of the Brooklyn Eastern District Terminal Railroad, and the FGC 100, General Electric 44 ton Diesel Electric, a former United States Navy locomotive that operated at the Jacksonville Naval Air Station. Coach cars in use include the Seaboard Air Line Coach 821, the 3518 & 3572 DL&W MU Cars, and the Union Pacific Lightweight Coach, while the Exas and Pacific (MP) Caboose 12070 is used as a Party Caboose facility. In addition to standard weekend excursions, a variety of special train excursions are offered throughout the year by the museum, including a Murder Mystery Dinner Train, a Cotton Tail Special Easter train, a Pumpkin Patch Express Halloween train, and a North Pole Express holiday train. Other special excursions include a Hobo Campfire Cookout, which offers roundtrip train service and a stop at an old-fashioned hobo campsite, A Hole in the Head Gang reenactment train, and a family-friendly Thomas the Tank Engine™ themed event. The museum is also the host site of the annual Parrish Chili Cookoff, which is presented as part of the city’s annual Parrish Heritage Day parade and festival. Train rentals are available for private special events and groups, including locomotive, party caboose, and car charter rental packages.